The McMichael Canadian Art Collection is synonymous with the Group of Seven. But its charm reaches beyond this obvious attention grabber. Like the paintings of these Canadian artistic pioneers, it’s all about the link between art and nature at the McMichael. The story starts with Canadian art enthusiasts and collectors Signe and Robert McMichael, who gifted the McMichael in 1965 to the Province of Ontario (it opened a year later) with the idea of creating a centre for the nation’s artists and their works. With grand windows throughout to offer views of the great natural landscape outside, the McMichael may be the best gallery space in the Toronto area. It also happens to be Signe and Robert McMichael’s former home, ‘Tapawingo’, which stood in the lush Humber Valley. When the McMichael’s bought 10 acres in 1952 to build Tapawingo, the Village of Kleinburg — with its main strip just up the road on Islington Avenue — was itself a hundred years removed from its roots as a milling settlement on the Humber. The coming postwar decades would be pivotal for both the town and the museum: Kleinburg’s aim was to keep its historic integrity amongst suburban boom and the McMichael has its transition from a quiet private residence to an expanding public institution. Kleinburg, 1905. Credit: City of Vaughan Archives. McMichael Canadian Art Collection & Kleinburg, 1956-1975. Note the additions to Gallery. Credit: City of Toronto Archives. To keep things in the present, the McMichael also has rotating exhibits of current contemporary Canadian art. The current photo-exhibition on until October 21, 2018, “…Everything Remains Raw”, is about the history of Toronto Hip Hop. Perhaps more impressive than the galleries themselves is everything outside them. An excellently paced and presented audio guide takes one through the grounds. It starts with the Tom Thomson Shack where the artist himself lived and worked in the last years of his life, famously for a dollar rent. Its original home was in the Rosedale Ravine in Toronto behind the famous Studio Building. Unfortunately, he left Toronto an excursion to his beloved Algonquin Park in 1907, never returning to his work-live studio. His death remains a mystery today. “Tom Thomson Shack in Art Gift to Metro”, The Globe and Mail, 20 June 1962. Credit: Toronto Public Library & Globe and Mail Archives. A small cemetery nearby houses the resting place of the McMicheals and members of the Group of Seven. The shape of their stones reflect each person’s work and character; Lawren Harris’ triangular marker for example evokes the mountains of his Arctic paintings. Further is a Sculpture Garden of the works of Ivan Eyre. The picturesque settings of the area as a whole allows the museum to open itself up to wedding shoots. lichen, a piece by Mary Anne Barkhouse and Michael Belmore featuring canines seemingly waiting for the bus, offers a whimsical yet provocative origin story. The transit shelter idea arose from the introduction of wolves to Yellowstone National Park, oddly enough. In the early 20th century, all large predators were removed from the park as a safety precaution to visitors, allowing the elk population to grow unchecked. To reintroduce ecological balance, Canadian Grey Wolves were reintroduced in 1995. Biologists who recommended the idea spoke local communities about the development, informing them the wolves would not be waiting at bus shelters for their children. The sculptures also reference the constant duality of effects of humans on nature and vice versa. Iichen was once located in the Toronto Sculpture Garden, too. Finally, further past Wedding Hill and David Ruben Piqtoukun’s Inukshuk, a path leads one down to the Valley Trails — foot and bike paths which meander along and across the East Humber in a way that might evoke the historic Toronto Carrying Place. A less adventurous but still stunning Gallery Loop Trail leads one around the McMichael’s fieldstone walls and massive fenestration. I get off the 100C Flemingdon Park bus at Broadview and Mortimer and cross the street. To the west, Mortimer becomes Pottery Road and is my route on the way to Todmorden Mills Heritage Site. A sign ushers me to the descent. And quite the descent it is! There are several topographical kinks within the city, and this street is definitely one of them. I’m no cyclist myself, but I have to feel for the people coming up the hill. 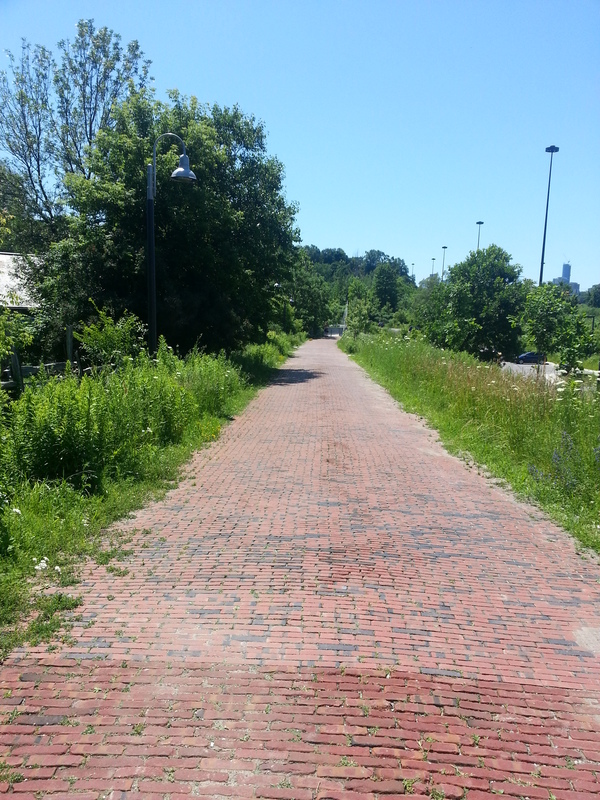 In fact, as I read more about it , Pottery Road ranks up there for people on bikes as the toughest to navigate. My pity pretty soon turn inwards, because I realise that I’ll probably have to muster the climb on the return trip. D’oh. Another sign and a bricked path ushers me into the Todmorden Mills grounds. 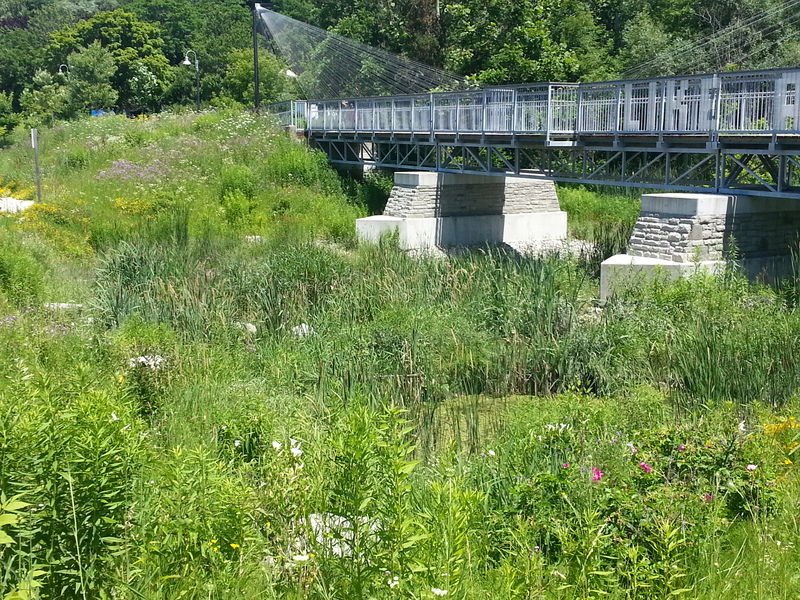 Located in the Don River Valley, it’s a site that claims both industrial and natural heritage. In 1967, it was re-adapted as a historic site and operates today under the City of Toronto Museums to help tell the story of Toronto. I was here once before, although very briefly to help out to an event. Today is a long overdue chance to do some more exploring of the museum and the great Wildflower Preserve I’ve heard so much about. (Although, ironically enough, I still don’t have an adequate amount of time to do a just visit). 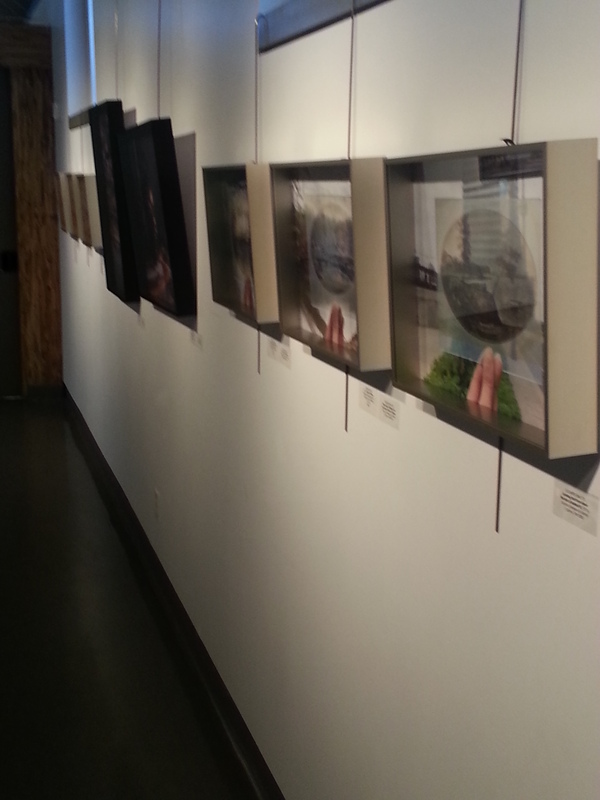 I also read about an intriguing photo exhibition in the Papermill Theatre, which is my first stop. 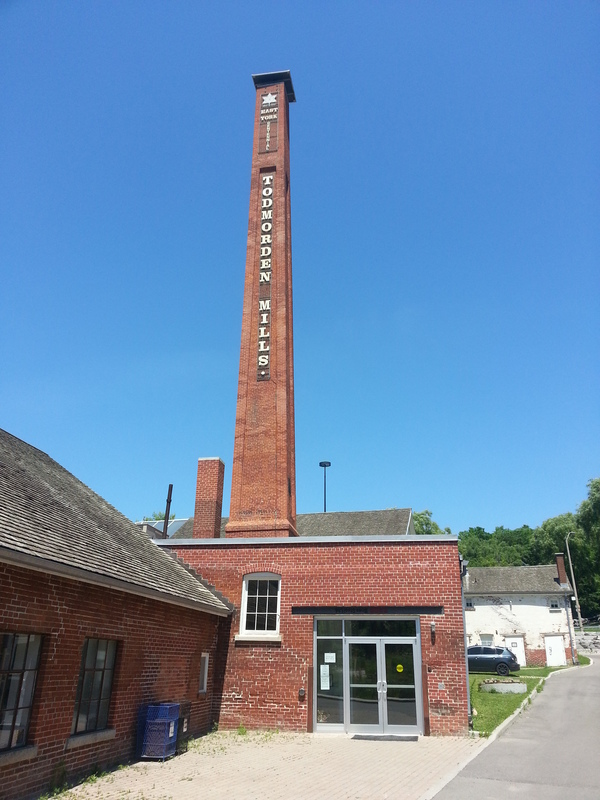 On the way toward the building, I have to look up to the smokestack, which was nominated for a 2013 Heritage Toronto Award for its recent restoration. Anyone who has ridden down the Don Valley Parkway has seen the chimney and its giant lettering. Inside the Papermill Theatre is an art show entitled ‘The Past is Never Far.’ It features the work of three people who have visually captured the city at various points in its history: Elizabeth Simcoe, who painted some of the first images of Toronto, William James, who took 6000 some odd photos of the city which are all digitized in the Toronto Archives, and Summer Leigh. If the last name doesn’t ring a bell, it’s because she’s the artist behind the show. Summer takes the images of her predecessors and photographs their subjects in their modern locations. So we can find James’ photo of the dirty foot of Yonge Street in 1909 mixed in with her take of the same site the 21st century. Or Lady Simcoe’s view of Toronto harbour in 1793 with the current incarnation of the shore as we see it today. It all makes for a great visual look into Toronto’s past and present. 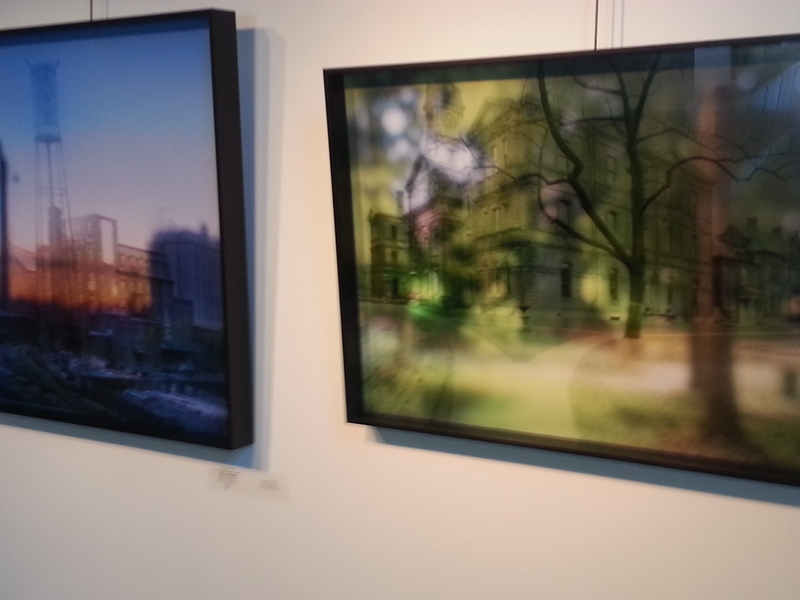 Taken together, the exhibition tells a great story. Its message comes in the title, and is something I have been saying and thinking for a while now: Toronto is a layered city. Some of its (her?) landforms and landmarks have changed a great deal. Some haven’t. Perhaps some of the changes aren’t immediately apparent to us, but they are there nonetheless. The past isn’t far. You just have to dig for it, do some analysis, maybe even put on a photo exhibition. That said however, perhaps some things do stay the same. Summer has one image up of William James that features the Don River Valley flooded in 1910. 100 years and a parkway later and we’re still facing the wrath of the overflowing Don. I shake my head and smile at that. Plus ca change, plus c’est la meme chose, n’est-ce pas? As a nice and unexpected treat, the artist herself is on hand, and I am able to pick her brain about what I see – whether she was actually at the disputed location of the Simcoes’ Castle Frank residence, as an example. Among the random things we talk about are old school horse drawn streetcars and being de facto tour guides for people in our lives. Through that chat it quickly becomes clear that she is a true buff in Toronto history, whose knowledge, talent, and vision really shows in her work. We probably can geek back and forth about the city for another good chunk of time, but alas, time isn’t abundant today and I graciously thank her again and make my exit. I head up to the brick path and continue down it. To my left, I see a familiar blue marker. 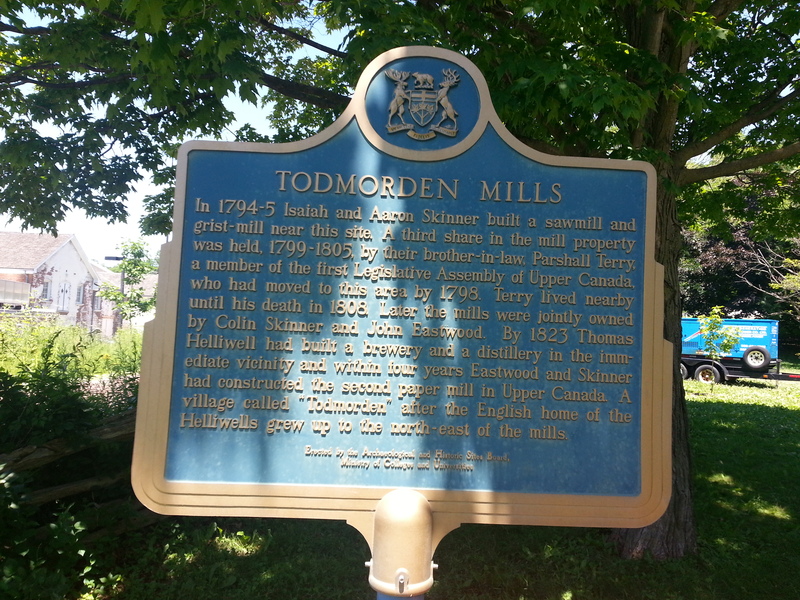 The Ontario Heritage Trust sign gives my the need-to-know of Todmorden’s history. I briefly circle around the exteriors of the buildings. I did some reading prior to coming, and, if I had more more time, I would enjoy a tour, but it will have to wait until next time. 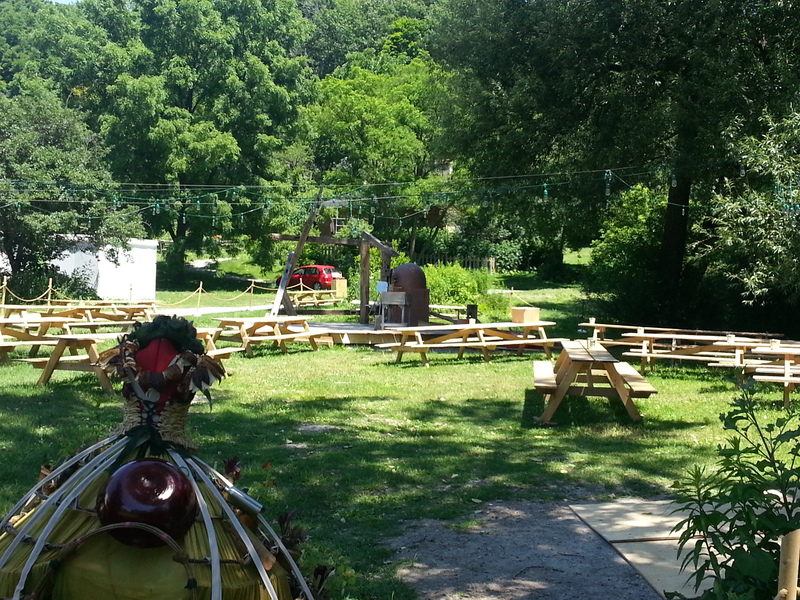 Also happening on the grounds of the museum is Eco-Art-Fest, an arts, heritage, culture festival put on by No. 9, who I first heard about during Jane’s Walk preparations. There is a designated ‘chilling’ area which has some pretty soothing country tunes going, an elevated platform (I think it’s also a stage) with an oven, picnic benches, and craft table where a few children try their hands at water colour painting (shoutout to Elizabeth Simcoe with that activity). I continue on the brick path once again, heading toward the bridge. I see a few joggers around, and I have to admit that it that this would be a very good place for a run. I would run through here if I loved closer. 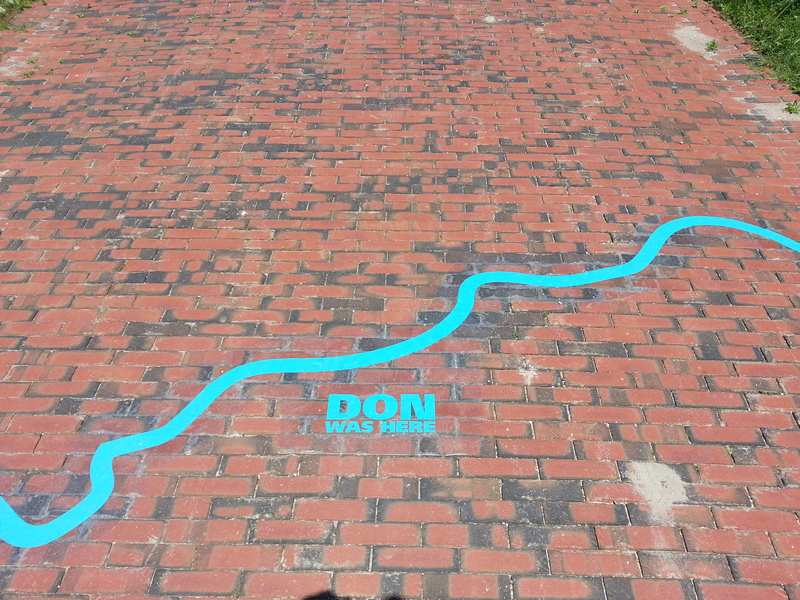 A few feet before the bridge is a swirly blue line with the words ‘Don Was Here’ in bold lettering. No, some guy named Donald hasn’t marked his presence. It’s actually a public art initiative commissioned by No. 9 and curated by Labspace Studio in partnership with the Toronto Region Conservation Authority. 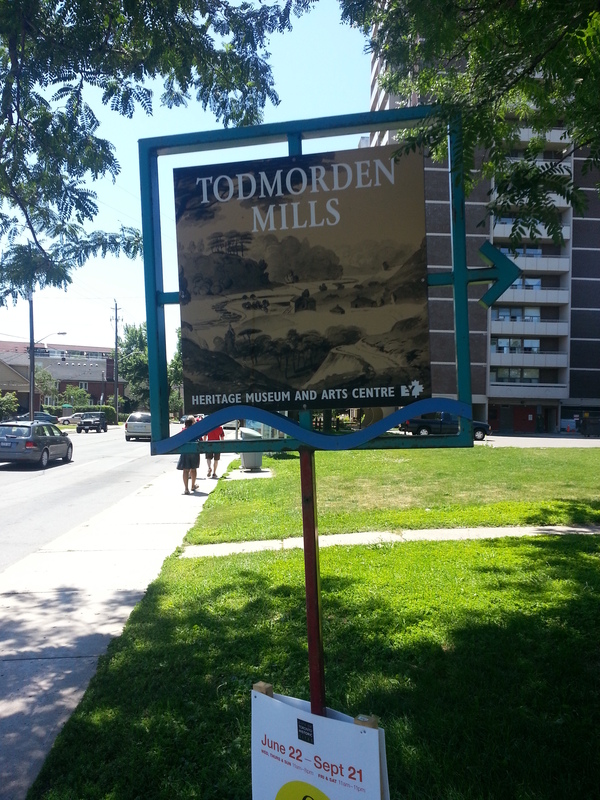 There are several of these ‘Don Was Here’ markers from Todmorden Mills to the mouth of the river which shows the meandering route of the Don before it was rerouted and straightened. It’s a pretty amazing tribute to the city’s natural heritage. The project has got an interactive site too…with a map! I notice some letter on the side of the bridge as I cross it, but may little mind to it (more on this later). Instead, I focus on the green area it overlooks. I walk around (passing another ‘Don Was Here’ marker) and inspect it a little better. Beyond that it looks really beautiful, I can’t pick out any species or just the entire ecological significance of it. I circle around and head back to the open area with the benches so I can give the Wildflower Preserve a walkthrough. I am greeted by a pair of signs to explain everything. It turns out the area under the bridge was the last area on the trail. I get the signs on my phone because I know I’ll need them. 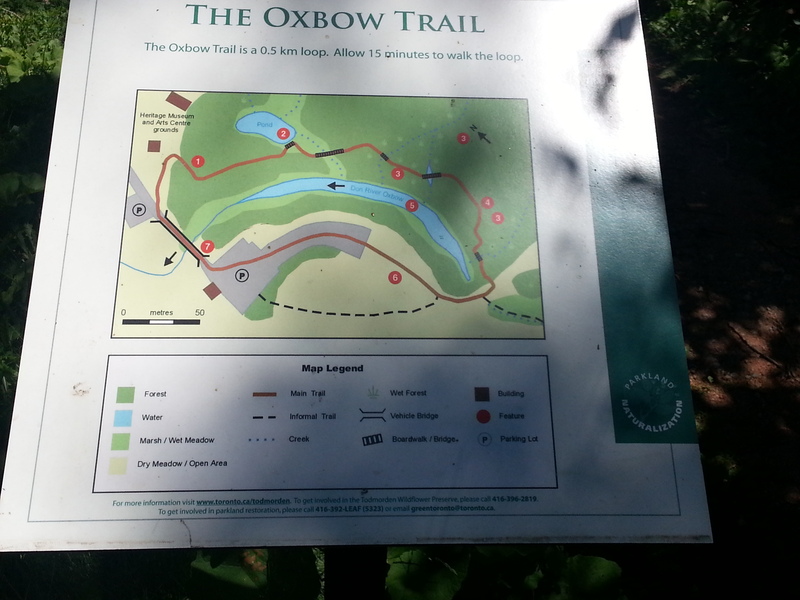 And hey, now I know what an Oxbow is. I spend a few minutes at the pond to take in everything. Gazing out and down at the green surface, I am hoping to spot something alive. Instead, I just see a pop can half-submerged in algae and just think somebody has really missed the point. I do catch movement, something skipping across the water. I can’t tell if it’s a fish or a frog, but I take it anyways and move on. The tree canopies are tall enough to make me feel closed in and away from everything, but even with the rustling wind, buzzing insects, chirping birds, I still can hear highway traffic. It’s a weird thing spot to be in. I feel like I’m in a secluded spot, but really, I am not. 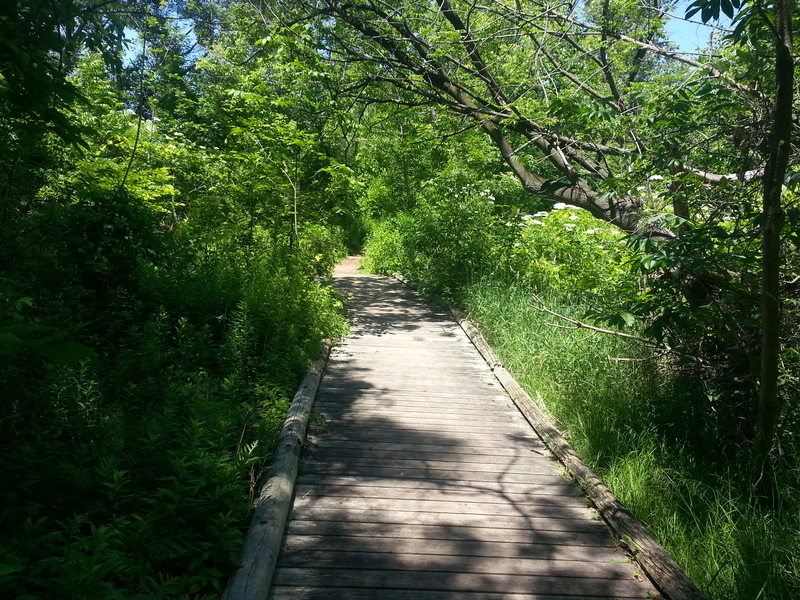 Actually, it reminds me of wandering the Betty Sutherland Trail near the 401. A city within a park, indeed. 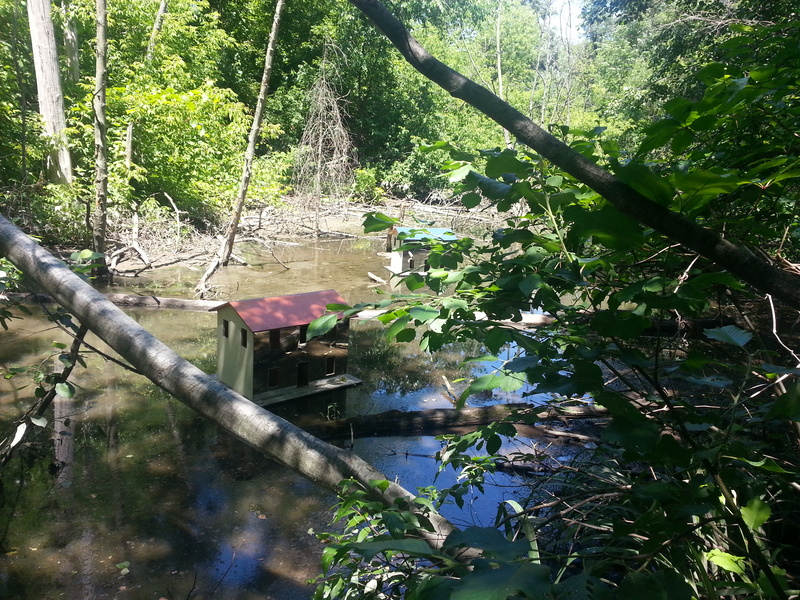 At one point, my curiosity is piqued when I spot what looks houses floating in the oxbow. I have to maneuver through and over things to get to the water’s edge. Yup, they are floating houses. Either some trekkers got really mischievous and creative or this is something deliberate and tied to the museum. I suspect the latter. I do some research after the fact, and the Ec0-Art-Fest website and its scrolling banner images provide the answer. The houses are an installation for the festival – as is the lettering on the bridge (which read from the other side says ‘Like a Bridge’) and the ‘Don Was Here’ project. Eureka! 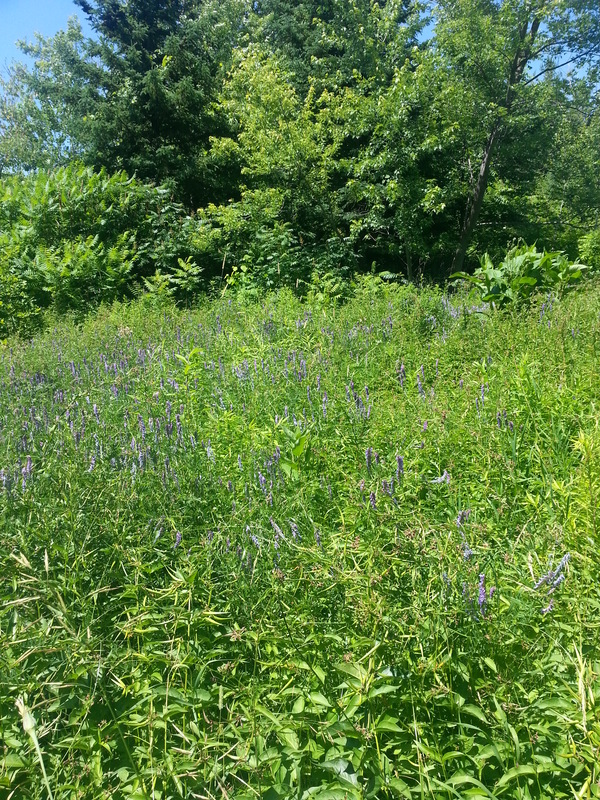 As I walk the paths, I try to see if I recognize any flora. 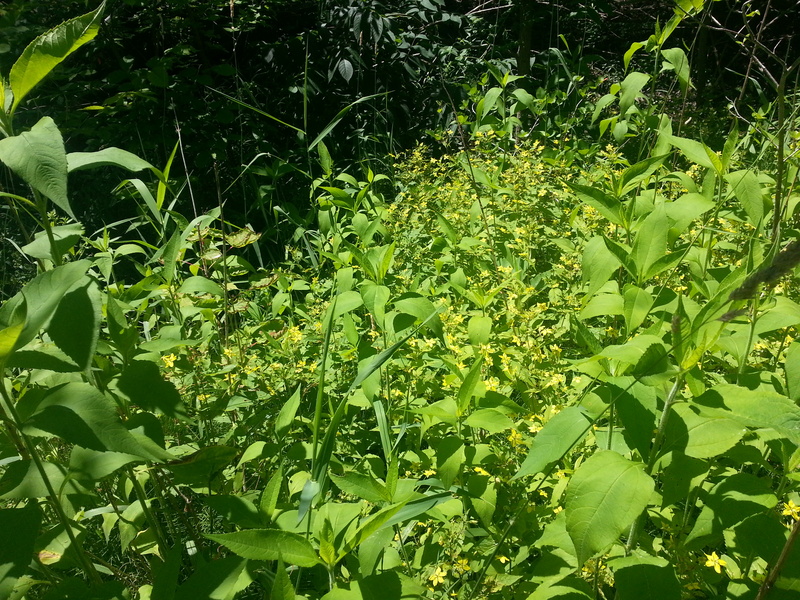 I think the yellow flowers are goldenrod, but I’m not willing to bet my guitar on it. In co-creating a nature walking tour last summer, I was introduced into identifying certain floral species, but it does not help me out here. 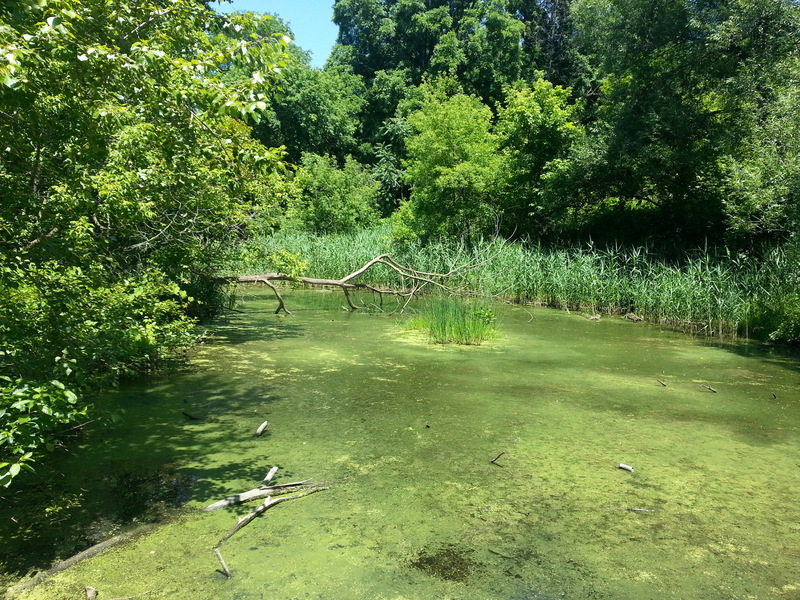 Instead, I just go back to marveling at the Preserve in a big picture sense. I remember something Summer said about our former industrial centres. 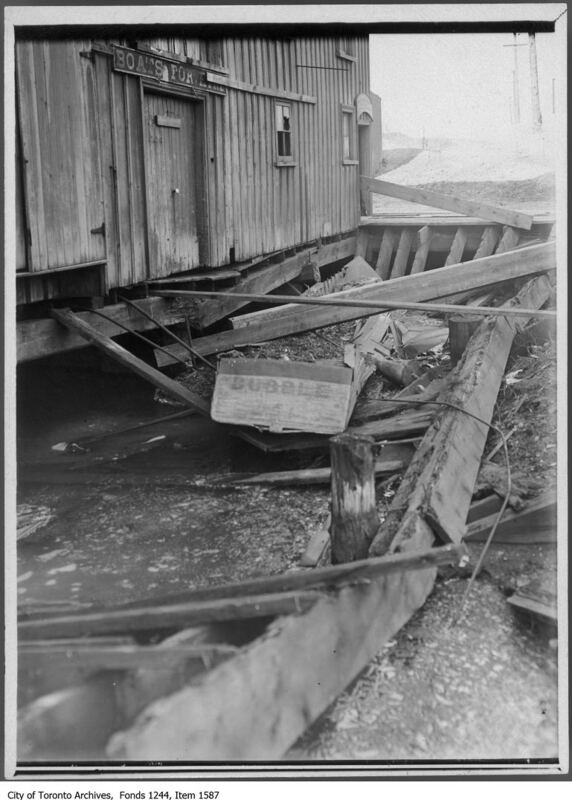 Places like Todmorden, the neighbouring Evergreen Brickworks, and the quarries of Greenwood and Smythe Parks were pretty dirty looking once upon a time. To see their conversion into beautiful natural and park lands is just remarkable. 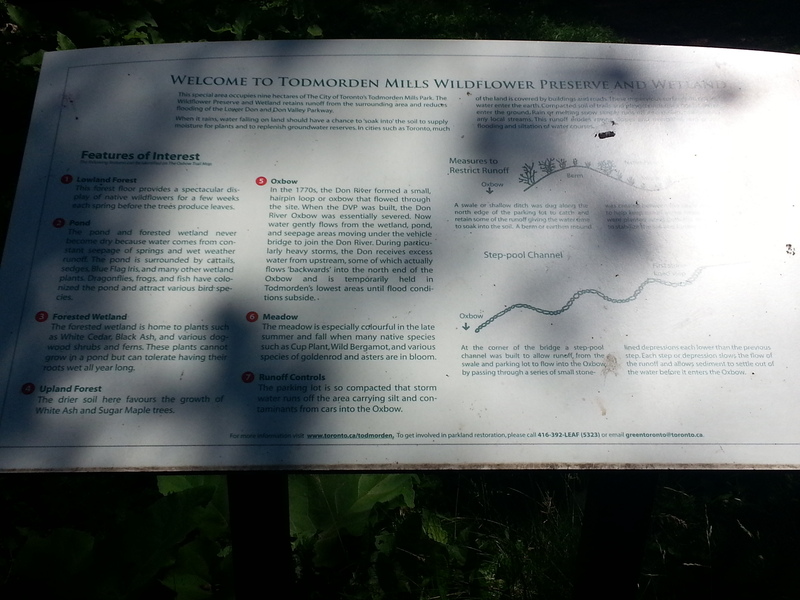 Tormorden and the Brickworks in particular have their own ecosystems, which makes this preserve more amazing to be in and think about. For a while I try to go off the main path onto offshoot routes, but then I realise that I really have no idea where they would end up. And I’m being stupid with time. So I turn back and get to the end of the wooded area. I’m at the back of the parking lot, and instead of walking through it, I turn around and tour the Preserve again. When I reach the beginning, I spot a warning I missed the first go around. I smile at the mention of the ‘East York’. The borough lives on. Walking back to Pottery, I give the museum one last look and then head off to do the climb. Part of me wants to visit the Brickworks, but I know this is not doable. I convince myself it would be a real beneficial exercise to power through at a quick pace, but halfway I’m a bit gassed and cursing my idea. 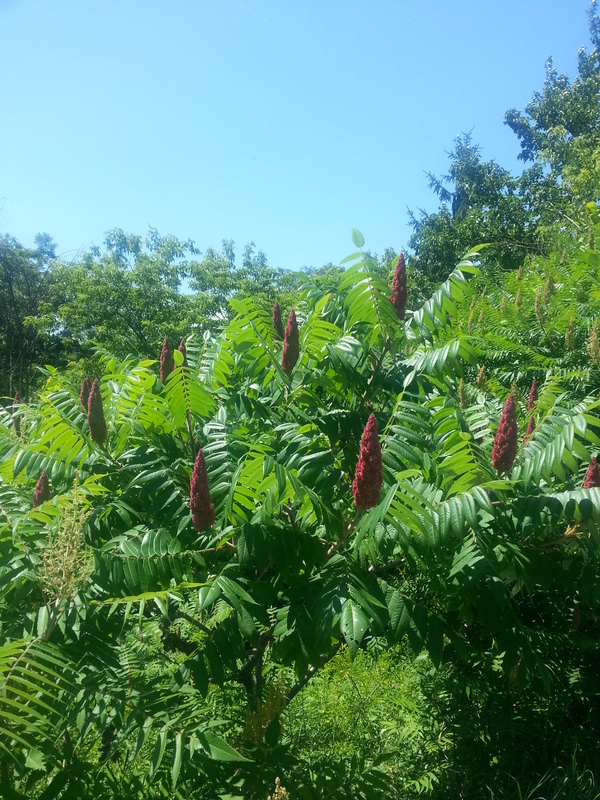 Fortuitously, I do break beside a Sumac, though! Happy that I recognize something, I leisurely finish the ascend and then make it back to The Danforth.